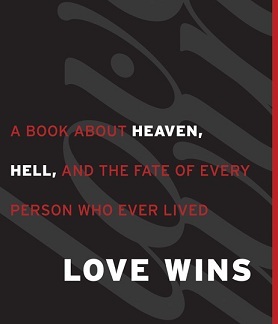 Review of “Love Wins” by Rob Bell: Chapters 7 and 8 | J.W. Wartick -"Always Have a Reason"
I have been reviewing Rob Bell’s book, Love Wins, with a particular interest in his theological views and how he argues for those views. I have not read the book before, so each review is fresh: I am writing these having just completed the chapter the post is on. This week, I wrap up the book by looking at Chapters 7 and 8. Within the next few weeks, I’ll publish a study guide and overview for the entire book. Rob Bell begins with an analysis of the parable of the Prodigal Son/Forgiving Father/Unforgiving Brother (Luke 15:11-32). He contrasts the prodigal with the older brother. The prodigal believes “he’s ‘no longer worthy’ to be called his father’s son” (165). But the father “tells a different story. One about return and reconciliation and redemption” (ibid). In contrast, the older brother sees himself as being cheated–he’s been “slaving for his father for years” (166). But the father turns the story around and points out he hasn’t been a slave–the older brother has “had it all the whole time… All he had to do was receive” (168). Given this story, Bell concludes a number of things. He argues “Hell is our refusal to trust God’s retelling of our story” (170). This retelling assures us that we are loved, despite the way we choose to tell our own stories. Then there is the notion that “Millions have been taught that if they don’t believe… and they were hit by a car and died later that same day, God would have no choice but to punish them forever in conscious torment in hell. God would, in essence, become a fundamentally different being to them in that moment of death, a different being to them forever” (173, emphasis his). He asks “Does God become somebody totally different the moment you die?” (174). Bell continues to focus on this argument, arguing that there is something “wrong” with this notion of deity which is “loving one second and cruel the next… if your God will punish people for all eternity for sins committed in a few short years… [nothing] will be able to disguise that one, true, glaring, untenable, unacceptable, awful reality” (175). Thus, Bell feels he can conclude “Hell is refusing to trust” (ibid). He continues, noting that the good news is better than merely the question of whether one will “get into heaven” (178-179). Instead, it is about “entering into this shared life of peace and joy as it transforms our hearts, until it’s the most natural way to live that we can imagine” (179). Our sins are “simply irrelevant when it comes to the counterintuitive, ecstatic announcement of the gospel” (187). Indeed, so are our “goodness… rightness… church attendance… and all of the wise, moral, mature decisions” we make (ibid). Instead, what matters is the “unexpected declaration that God’s love simply is yours” (188). “Forgiveness is unilateral,” God doesn’t wait for us to clean ourselves up, but “has already done it” (189). “The only thing left to do is trust” (190) Bell argues. “Everybody is at the party. Heaven and hell, here, now, around us, upon us, within us” (ibid). Bell is absolutely correct to note that the Gospel is about more than simply “getting into heaven.” There is a kind of gospel reductionism which changes the message of Christianity into heaven or hell and that’s all. It’s dangerous, and it distorts the proclamation of Christ. However, there is something very bothersome about Bell’s arguments against the notion of eternal punishment. His entire argument is based around the notion that God is love, and that God won’t just change who he is. He continues to focus on God as love. Yet he does this at the expense of the rest of the Biblical teaching about who God is. God is not reducible to love. We can’t base our doctrine only on the notion that God is love, and therefore our ideas of what love is will define who God is. Instead, the Bible teaches us much more about God than that God is simply love. How does this fit into Bell’s analysis? Why does he refuse to address the fact that the Bible very clearly state that God hates wrongdoing? Nor does Bell acknowledge that one of God’s attributes is justice. God is absolutely just and we deserve God’s wrath. Period. Instead of even attempting to address these verses or the arguments around the notion of God’s justice, all Bell has done is argue that God is love and that anything else means God changes his essence. That is simplistic and borderline dishonesty. Bell his misportrayed the doctrine of God and invented his own, wherein only the verses about God being loving are those which dominate all doctrine. Again, he has created a canon within the canon, where the verses about love trump all others. Another demonstration of this is in Bell’s declaration that our sins are “irrelevant.” Really? Orthodox Christianity has held that our sins are the reason Jesus had to die–as punishment for our sins. That sounds extremely relevant to me. Yet Bell, in his over-eagerness to argue that God is love, has vastly overstated his case. God does not change (Malachi 3:6), but neither is God only defined by love. And even were God defined by love, that love would not be human love, which is what Bell has chosen to base his argument upon. Again and again he appeals to the relationship between human parents and their children. Yet God is not a human being (Numbers 23:19). What room is there in this passage to allow for Bell’s scheme of salvation after death? People die, and after that there is judgment. Period. It doesn’t say “people are destined to die… then to have hope forever and eventually come to heaven.” Where does Bell ground his teaching in the Bible? I simply cannot find it. Instead, he continues only to press the notion that God is love, and by doing so he creates his own Bible outside of the Bible which trumps the passages with which he disagrees. As Christians, we must take into account the whole of Biblical teaching. We can’t just ignore the passages which don’t agree with our theology, as Bell has done. Bell’s entire argument so far seems to be a house of cards. It is based on a few select verses with an idiosyncratic interpretation. Moreover, he simply declares that God is love, and then uses that to counter anything he thinks is not loving. In other words, Bell’s concept of love defines his theology of God. That is a huge problem. In this very short chapter/conclusion, Bell calls people to trust God. He tells readers that “love wins” (198). “Love is what God is” (197). There’s not much in this chapter which hasn’t been said before. It is worth noting that once again, Bell defines God merely as love. That’s it. I believe I have shown Bell is mistaken on any number of points. His emphasis on God as love is wonderful. We do need to make sure that is part of our doctrine of God. But Bell’s doctrine of God just is love. Moreover, Bell has defined that doctrine of love through human categories instead of divine categories. He ignores the themes in the Bible about God’s justice. Indeed he ignores explicit statements of God’s justice and hatred for sin and even sinners. Doctrine of God must balance these statements in the Bible, not use one to trump the other. Bell has done the latter. Within the next two weeks, I will be publishing a study guide for the book, along with a general overall review. As always, let me know what you think. The book: Rob Bell, Love Wins (New York: HarperCollins, 2011). Review of “Love Wins” by Rob Bell: Preface and Chapter 1– I discuss the preface and chapter 1 of Love Wins. Review of “Love Wins” by Rob Bell: Chapter 2– I review chapter 2.
Review of “Love Wins” by Rob Bell: Chapter 3– I look at Chapter 3: Hell. Review of “Love Wins” by Rob Bell: Chapter 4– I look at Chapter 4: Does God Get what God Wants? Review of “Love Wins” by Rob Bell: Chapter 5– I analyze chapter 5.
Review of “Love Wins” by Rob Bell: Chapter 6– I review chapter 6. Love Wins Critique– I found this to be a very informative series critiquing the book. For all the posts in the series, check out this post. Rob Bell, Love Wins (New York: HarperCollins, 2011). This is another great review and further reinforcement of my growing belief that Bell’s soteriology is not very robust, thought-through, or Biblical. Your statement is only a contradiction under the assumption that the judgment must be of an infinite nature (so, it’s not a *flat* contradiction, it’s a *qualified* contradiction). When Jesus spoke of the unforgivable sin of blaspheming the work of the Holy Spirit, he said that it could not be forgiven in this age, nor in the age to come. This would imply that other sins can be forgiven in the age (aion) to come. Aion and its variants (aionian, aionios, etc.) are commonly erroneously translated as “everlasting” when they should just mean “related to the age to come.” Some folks will receive next-age life, while others will undergo next-age punishment as a condition of their reconciliation. A just God repays according to the specific gravity of the infraction, and the Bible tells us many times that God does this (and that he is just BECAUSE he does this). God prescribing blanket everlasting torment for the tiniest infraction is not consonant with these verses. So while Bell’s argument that “God is love” is incomplete, “God is love and justice” is similarly incompatible with everlasting torment in response to the faults of created beings.